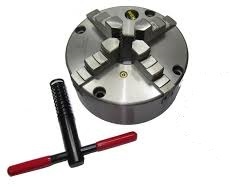 0604FO 6" (160 mm) Precision 4-Jaw Self-Centering Lathe Chuck . Precision semi-steel body. American standard top quality. 2 pc tongue and groove reversible hardened jaws. Straight recess (plain back) spindle mounting.